‘…as believers we’re not immune to hard times, and the three of us definitely know what it feels like to be discouraged. But as believers we have verses like Galatians 6:9 which says “Let us not become weary in doing good, for at the proper time we will reap a harvest if we do not give up” to hold on to and claim during those hard times. We even wrote a song on this record called “Panic” to remind us to not freak out when times are bad, to remember to go to Gods promises and hold tight to them. God has a crazy way of turning your mess into a message, and turning bad things for His good…’ 1 Girl Nation burst onto the scene in 2013, comprised of 5 young girls from all across America and all across different backgrounds, all united to deliver a message of hope, encouragement and impact, as their self titled album became one of my favourite albums of that year. Formed through an audition process rather than the natural way of friends joining each other in the band, 1 Girl Nation went through changes and transition since that year, with 2 founding members, Kelsey Grimm and Lindsey Adamec, stepping down from the band, and the 5 piece now becoming a trio. In spite of this, 1 Girl Nation (now officially called 1GN) are now back with their second album, full of hope, life, laughter, excitement and enjoyableness as before. Though it is somewhat noticeable that they have undergone change and have lost members in the process when you hear the tracks, the album as a whole is as emotive and poignant, maybe even more so, than their self-titled debut. 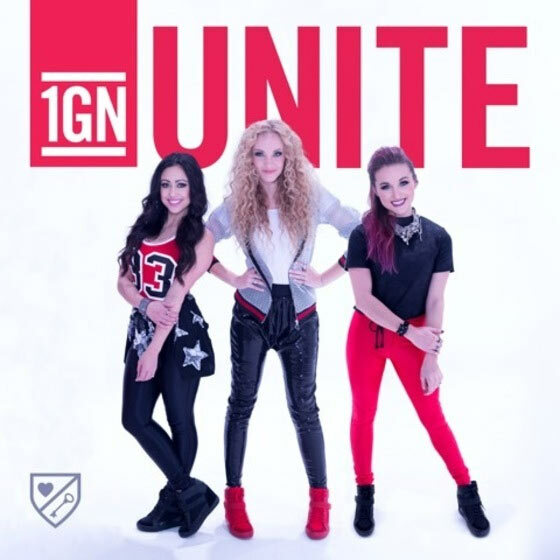 From the happy and fun-filled “Get Hype” to their most personal track to date “Guard Your Heart”, the 90s throwback “Impossible” and the sure to be mainstream hit “Unite”; Kayli Robinson, Carmen Hadley and Lauryn Taylor Bach each deliver their all in an album that is by far one of the most underrated in 2016 to date. Released in February 2016, “Get Hype” is the first radio single from the new album, and while the song’s meaning can seem a little ambiguous, the song is certainly energetic and fun-filled. Lauren-Taylor, Kayli and Carmen certainly know how to deliver a song that’s definitely going to rival any one of the current mainstream music acts on radio at the moment. And while there will certainly be hate for this song (because honestly, can we really pinpoint a spiritual message in the song, other than to ‘get hype’ because of what Jesus did for us all those years ago? ), these three girls of God nevertheless stick to what they believe to be true. To be hype may not necessarily mean to be in on the trends, or even up to date with the fashions of the time. To be hype is to be relevant and real for the right reasons, to know what it is to live in the world yet not be consumed by the mass hysteria for this thing and that. Jesus when He was living was hype for that time period, and even now all these years later. Maybe this song is reminding us to be hype as Jesus was, to ‘…get up, get loud, tell everyone you know, around the world from left to right, it starts tonight…’ And while I know I may be trashed by not saying anything negative about this track, as many people are on youtube (just google ‘Get Hype’ and you’ll see what I mean), these three girls nevertheless deliver a song that, while it isn’t definitive about what it stands for, is by far a better option to listen to than any other mainstream music on the radio at the moment. Kudos to the band for creating a song that is clean, fun and happy, something that isn’t necessarily championed on mainstream radio of late. While “Get Hype” is sure to be the talking point when anyone checks out Unite over the next few months, what many may fail to put together is that the remainder of the album (the other nine tracks) are indeed Christ centred, even if the first one isn’t. Carmen, Kayli and Lauryn-Taylor have matured both in a music and lyric sense when comparing Unite to their self titled album in 2013. With 3 years comes a whole lot of hope, encouragement, wisdom and a clarity that is brought to the fore within these songs. Yes, “Get Hype” may be the only song that is seemingly fun-filled and nothing to do with the gospel, yet if listeners stop there and attack, they may not be impacted by the remainder 9, which is nevertheless sad. Yet I’m sure Unite will speak to whomever Christ wants the album to speak to, and who knows, maybe those who have hated on the album (and “Get Hype” in particular) may grow to love it in the future. “The One” follows on from “Get Hype”, and the pace changes from a dance number to a pop anthem littered with Lauryn’s fast-talking/rap segments throughout, and Kayli’s powerful voice at the forefront. The theme is quite simple- everyone is looking for ‘the one’, and if we long to find it in our spouse, or even our family, ultimately they will come up short- because after all, everyone is human. We all have our ideal pictures of who we believe ‘the one’ to be, yet this song turns it all around and declares that Jesus is ‘the one’ we all ought to run after. Which is in fact a true statement- that Jesus is the one to comfort, to heal, to bring about change and encouragement, to challenge and motivate. Society may tell us that we will find complete wholeness in this person or that, in this thing or that, yet what Jesus tells us remains- that ‘…You’re the one, the one, who’s always by my side, You’re the one, You’re the one, for me You gave Your life…’ Thanks to Carmen, Kayli and Lauryn-Taylor for such a timely reminder of this fact, presented in a song that is one of my favourites in Unite. Starting with electronic keyboards, “Haters” fuses together pop and rap in a clever way, as the song wrestles with the theme of online cyberbullying, and tackles the subject with grace and poise. As we’re reminded through these lyrics that ‘…haters gonna hate, love ‘em anyway…’, these simple lyrics can have a profound impact, to me at least. No matter what we say or do, just because we are Christians, they’ll always be something that someone will hate us for- and that doesn’t really matter in the grand scheme of things. Because it is when we’re changing this world for good that the devil will come and try to shake the ground we’re standing on, bringing along people that’ll hate on what we do rather than encourage us for taking a stand on issues close to our hearts. “Haters” is a reminder that we’re always going to have obstacles, but to take heart because ‘…if you got haters, that ain’t nothing new, even Jesus had haters just like you…’ “#NoFilter” begins with a strong drum beat and photograph clicks to again present a controversial theme of unfaltering our lives online, as we’re faced with an issue that all of us fall into- showing our best selves to the online world, while hiding away what we truly feel. Our facebook and twitters are filled with posts, yet are we really willing to post our good times and bad, our triumphs and tribulations, our happy and sad days, all for the world to see? If we want to be real, to be known, loved and to love, “#NoFilter” tackles the question for all- why don’t we be as real face to face, than we do online? Controversial, yes I know, but “#NoFilter” is I’m sure exactly what this generation needs. Social media needs to be transparent and maybe this song will encourage us to travel in that direction. “Cinema” also tackles the hard issues, as this 3:02 track is packed with heart, hope and a whole lot of Lauren Taylor rapping in the bridge, as we see, what I reckon, is a rising star in the realm of rap, maybe even rivalling that of Manny of Group 1 Crew or even TobyMac himself. The song is as challenging as the others aforementioned, as we are presented with this theme- that if our lives were a movie played in a cinema, who would play the lead- us or God? How will the story end? What would be the genre? Would the tickets sell, and what would it be based on- the lead in the story, or the storyline itself? These are all questions we need to think of as Christians- are we really placing God at the forefront of our lives, or are we saying that Christ is in control, when in fact we are? Kudos to the band for this song, quite possibly one of the most emotive and hard hitting for myself, and hopefully many more who listen, as we are reminded to always focus on Christ the leading character of a story that is really not about us, but about what Christ can do in us, through us, and for us as we closely follow Him all our days. “Panic” and “Guard Your Heart” are the final two songs on the album, and both of these songs are highlights for myself, and the band as well. Both are different, as the former speaks about worry, and not panicking as we know that God has situations under control, while the latter impresses a central theme upon our hearts- for us to indeed guard our hearts from the hurt, pain, evil and chaos that is part and parcel with the world we live in. Protecting our hearts isn’t a sign of weakness but of strength, as we know what our hearts can and cannot handle. Similarly, to panic is to be human, but then we ought to know that ‘…I will not stay down, no, I know You’re here now, I won’t freak out, don’t panic now, don’t panic now…’ “Panic” has a BarlowGirl-esque feeling to it- which is great, and complete with strings, light percussion and powerful harmonies, maybe we have found the answer to who is going to replace BarlowGirl, both in a musical and lyrical sense, since their departure in 2012? “Panic” is a song for us as we focus our eyes on the Lord, knowing full well that we indeed don’t have to panic when things are awry. As spoken by the girls themselves about “Guard Your Heart”, the song ‘…has been an anthem to each of us in our own lives. This song was written from Proverbs 4:23 which says “Above all else, guard your heart, for everything you do flows from it.” We want to use all the songs and truths on this album to combat the contradicting messages being thrown at our generation…’ Both these tracks are as impactful and important as each other, and together with songs like “#NoFilter”, “Cinema” and “Haters”, make up the backbone of Unite, both lyrically and musically. Kudos to the band for such encouragements, as this album quickly becomes one of my favourites of the last couple of months. ‘…God has taught us so much through this transition. We started writing songs for this record over two years ago, and little did we know it would be the truths in these songs that would get us here! We couldn’t be more excited to share these songs. We hope when people listen to this album they feel more empowered to live boldly for Christ! We hope they use it as tool to share the gospel with their friends…’ Unite has been a long time coming for a band that was my favourite new band of 2013 (alongside Love and the Outcome). And while in music terms 3 years is a long time, 3 years is 3 years more maturity, certainly displayed in the lyrics of the album as a whole. While the album will have its fair share of critics, cynics and champions (I will be championing this album through and through! ), one thing is clear- 1GN have a mission, and that is to spread Christ’s love. Encouraging and hopeful, fun-filled and impacting, more so than any other mainstream album released today, Carmen, Kayli and Lauryn-Taylor continue to wow us in these 10 songs, full of life, fervent honesty, musical experimentation, and the infusion of rap in practically every song. Well done to this trio for such a comprehensive and inspiring album! Maybe they can fill the void left behind by artists like BarlowGirl and ZoeGirl?